Regular maintenance will improve the life and longevity of your machine. Be sure to clean and oil your machine regularly. When you require service, have a Certified Technician perform the necessary repairs. Remember, a consistent maintenance schedule will insure that your machine will run efficiently for years to come! We currently have a certified technician who can work on your machine(s). 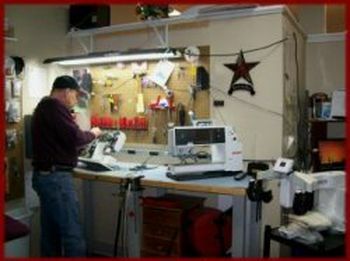 Tommy Leitner who lives in Cayce, South Carolina and his shops name is White's Sewing Center, Phone Number 803-771-6300. Tommy makes scheduled trips to Camden to service machines. If you have a sewing machine that needs service please contact Emmies (803-272-0051) to be put on the schedule. An $85.00 deposit is required to be put in line for servicing. Tommy has a maximum number (20) of machines he can service in a day.